Welcome to the second part of this food roundup series! I hope you are enjoying it as much as I am, writing it. Let's get right in to some food finds of the month. It's a tough job, but someone's gotta do it! With Oprah's annual release of her Favorites list, I was thinking about how I had never tried her cookbook before! A savory hash is a delicious breakfast, or dinner, in my opinion, and this one was pretty great! I veganized it by using a vegan sausage, Field Roast Apple Sage sausage, which is a vegan faux meat favorite (I've always thought vegan sausage tastes worlds better than animal sausage). This was really tasty, but there is a restaurant in Los Angeles called Blu Jam Cafe that makes the best hash, and I don't think this measured up to that one. This may be the best thing I've ever baked- it's so good, I may have to rethink calling myself a chocolate person! I'm a huge fan of Chloe Coscarelli- her recipes are simple, and out of this world, and pretty much always deliver. 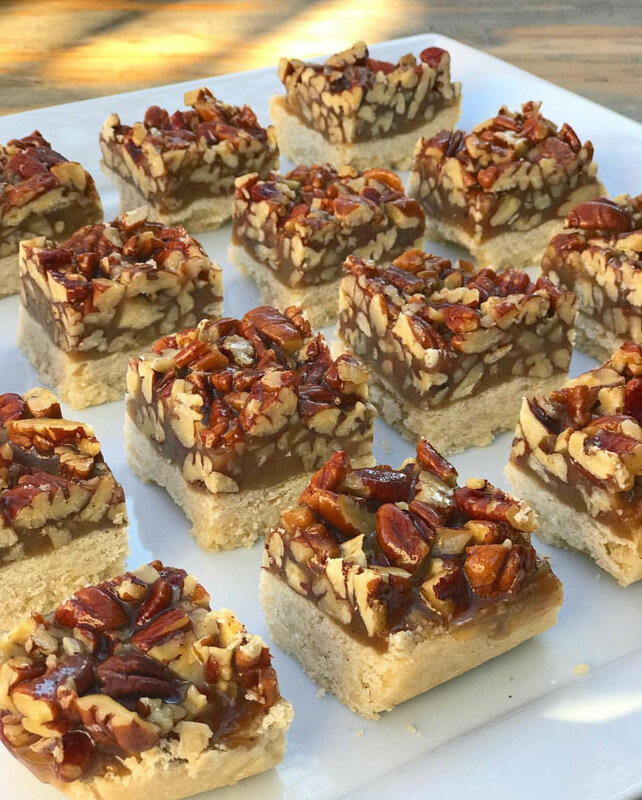 These pecan bars were no exception. Everyone I've given them to has raved about them. I cannot recommend Chloe's cookbooks enough! This is from her desserts cookbook. What a delicious, beautiful sandwich- and only $8.00! (In LA, something like this could easily sell for more). This was my first time at Fala Bar, at the Melrose location, which is really a hole in the wall, and they told me this kale burger is one of their most popular items. 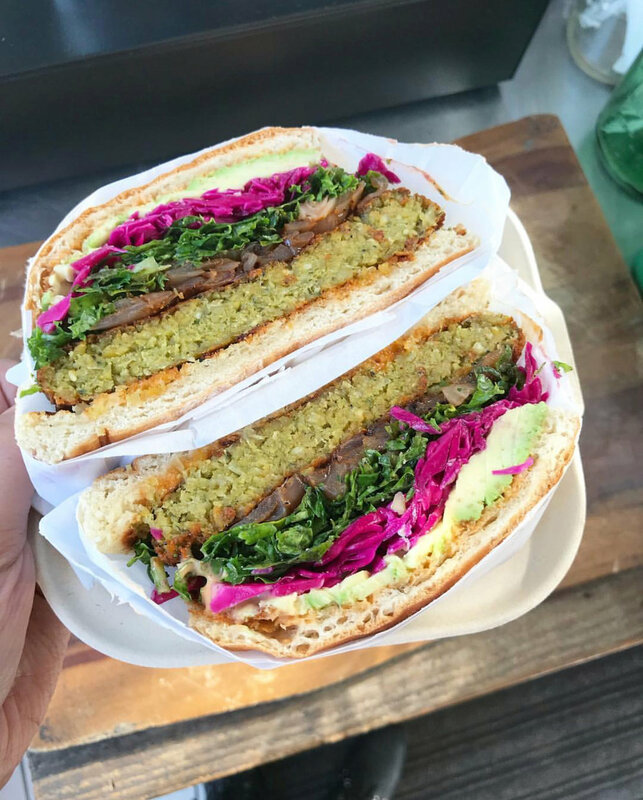 The Venice one is supposedly much bigger with more option, and is really photogenic, including a neon sign that says "No Fake Sh*t." This is one of my new favorite sandwiches in LA, even though I'm not the biggest fan of falafel. Note that layer of avocado! I'm excited to check out the options at the Venice location. I believe it's completely vegan! It feels like this is my first time trying a pizza, considering how different this Napoletana pizza is from anything else I've ever tried. The pizza was chewy and doughy like fresh pita bread, and the sauce was so fresh tasting. I was concerned there was only a little basil and garlic, but this was a dish where simple is perfect because the dough and sauce are so well done on their own. This was located in the new Eataly, which is a very beautiful and romantic Italian type cafeteria and shop! There is beautiful fresh produce, different stations like pizza, pasta, sandwiches, espresso, etc, and a shop with Italian sodas, pasta, etc. My Italian American chef friend Leslie Durso said this was the best pizza she's ever had in LA, and I agree with her. Run, don't walk, to the new Eataly! I don't think you'll be able to avoid the crowds, this is a serious hot spot at the moment! Please let me know your food finds if you have any great ones, I'm always looking for new recipes, restaurants, and products! Hope you have a great start to your December!